During the machining process in woodworking applications, vacuum clamping is commonly used as a safe and easy method of clamping workpieces on CNC routers or other machines. Here we compare the effectiveness and cost efficiency of various types of vacuum pumps available on the market for this application. Regardless of whether vacuum clamping is performed using grid tables, table carrier systems with vacuum blocks, suction through an MDF panel or by using templates, all vacuum clamping systems have one thing in common – they require a vacuum pump to build up the vacuum. 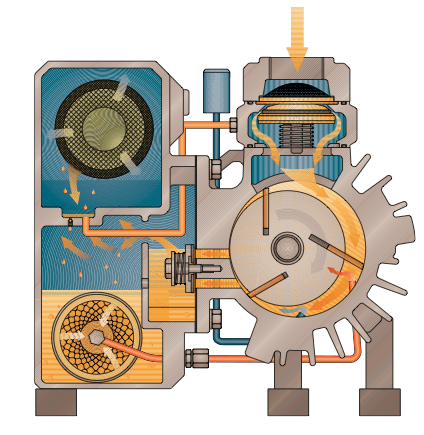 Ultimate vacuum: the lowest pressure a vacuum pump can achieve. Suction capacity: this figure determines the amount of air that a vacuum pump can supply or discharge in a certain period of time. The higher the suction capacity, the faster air is discharged and the faster the ultimate vacuum can be obtained. In everyday work, this means that a high suction capacity will reach the required clamping force faster. In addition, a high suction capacity can help to compensate for leaks in the clamping system. Power requirement: mechanical vacuum pumps are driven by electric motors, which consume different amounts of energy depending on the design and efficiency of the vacuum pump. To achieve maximum efficiency, it is important to use vacuum pumps designed for the specific requirements of an application. 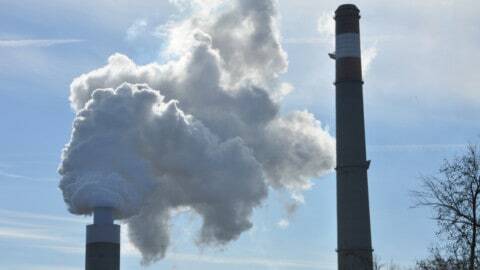 At the same time, energy consumption must be kept to a minimum. Figure 1. Oil lubricated rotary van vacuum pump. These vacuum pumps (Figure 1) have been used in woodworking applications for many decades. They achieve a very high vacuum of <1 hPa (mbar). They therefore guarantee ample suction capacity and are characterised by fast clamping and being less sensitive to major leaks in the line system. The internal oil lubrication requires some maintenance effort, such as an oil change and filter replacement every six months. Figure 2. 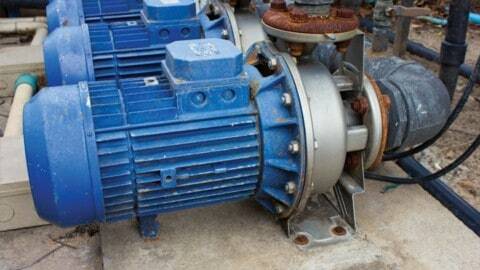 Dry running rotary vane vacuum pump. 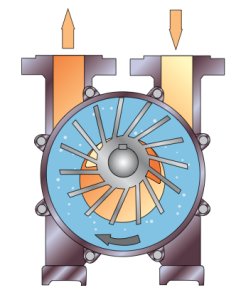 The operating principle behind dry-sealed rotary vane vacuum pumps (Figure 2) is the same as that of the oil-lubricated versions described above, but without the necessity of oil lubrication. 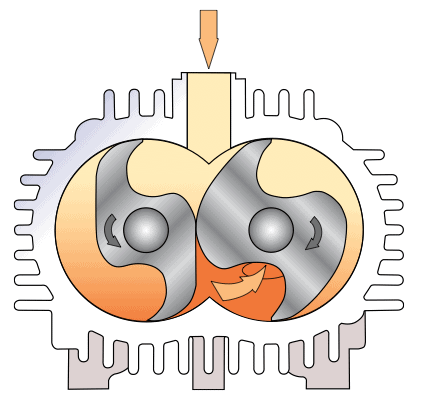 The advantage of operating without any operating fluids is, however, counterbalanced by the disadvantage of a less powerful vacuum and increased vane wear. The vacuum and the suction capacity are reduced during operation due to higher wear. After 2,000 operating hours, a dry-sealed rotary vane vacuum pump achieves only 85 to 90 per cent of its original suction capacity. This must be taken into account when designing the vacuum pump. If the vanes are not replaced regularly enough, they can suddenly break due to wear. 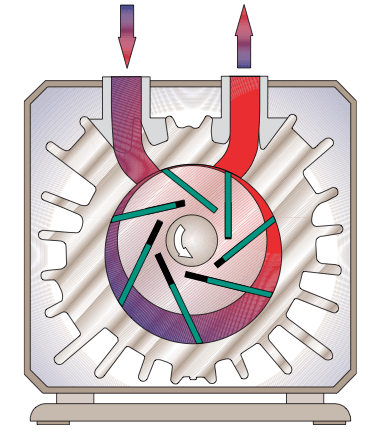 This will cause immediate standstill of the vacuum pump and result in production downtimes. 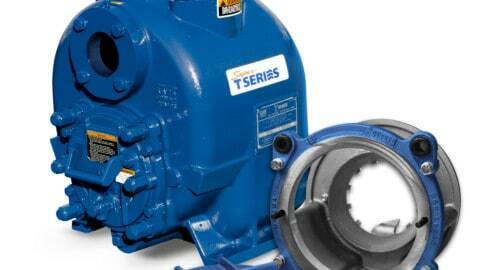 Despite these disadvantages, these vacuum pumps are still commonly used. Figure 3. Liquid ring vacuum pump. Liquid ring vacuum pumps (Figure 3) usually use water as the operating fluid, which is pumped in a closed circuit. These vacuum pumps are very rugged and resistant to inducted humidity and vapours. However, their power output depends on the temperature of the operating fluid. Ideally, the water temperature must remain between 15 to 20°C. If water evaporates, the salts contained may be deposited in the system. Medium-density fibreboard (MDF) dust that enters the water circuit may also collect in the vacuum pump as sludge. For this reason, the water level of liquid ring vacuum pumps must be checked and refilled regularly. When processing MDF, it is necessary to regularly replace the water and clean the vacuum pump. Figure 4. Rotary claw vacuum pump Mink. Lobe claw vacuum pumps from Busch (Figure 4) are dry-sealed vacuum pumps that operate without oil or water as operating fluids. The most significant difference between these pumps and dry-sealed rotary vacuum pumps is that the moving parts do not touch each other. This means there is no friction and therefore no wear. Therefore, only minimum maintenance work (or none at all) is required and there are no costs involved due to wearing parts. This makes claw vacuum pumps the most efficient pump type and also has an extremely positive effect on required drive power. Lobe claw vacuum pumps are the only vacuum generation systems for woodworking applications that can be equipped with efficient variable-speed motors. These vacuum pumps can therefore be optimally designed for the process in question. This offers further energy-saving potential and makes it possible to increase the suction capacity by approximately 20 per cent. 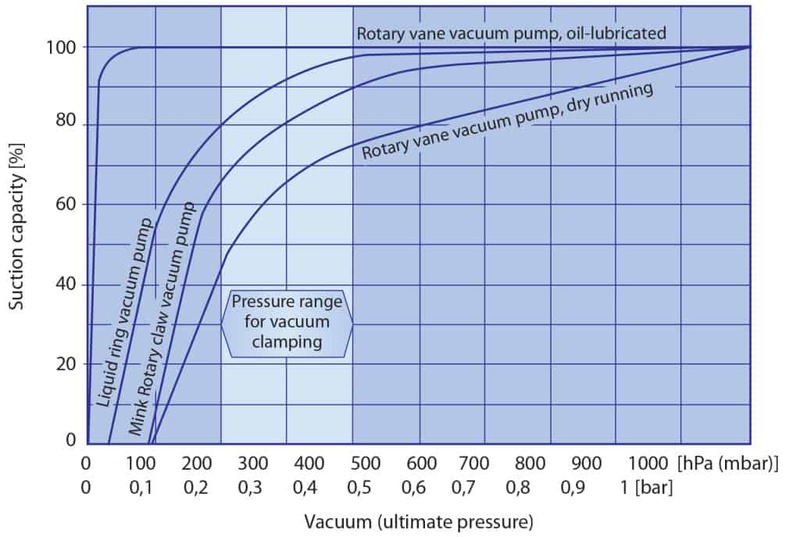 Figure 5 compares and contrasts the performance characteristics of various vacuum pumps. 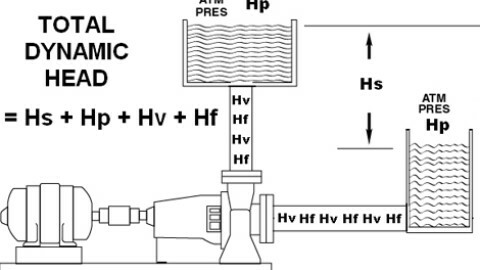 It shows that oil lubricated rotary vane vacuum pumps still produce maximum suction capacity in an operating range of 200 to 400 (hPa) mbar, whereas dry-sealed rotary vane vacuum pumps only produce 45 to 75 per cent suction capacity within the pressure range in which clamping is carried out. If the two most commonly installed vacuum pumps are compared with each other after an operating time of 2,000 hours (Figure 6), it is clear that the performance of the dry-sealed rotary vane vacuum pump decreases considerably. This performance loss can only be compensated by a larger rotary vane vacuum pump. This in turn has a negative effect on energy consumption. Figure 5. Comparison of the performance data of the different vacuum pumps. Figure 6. 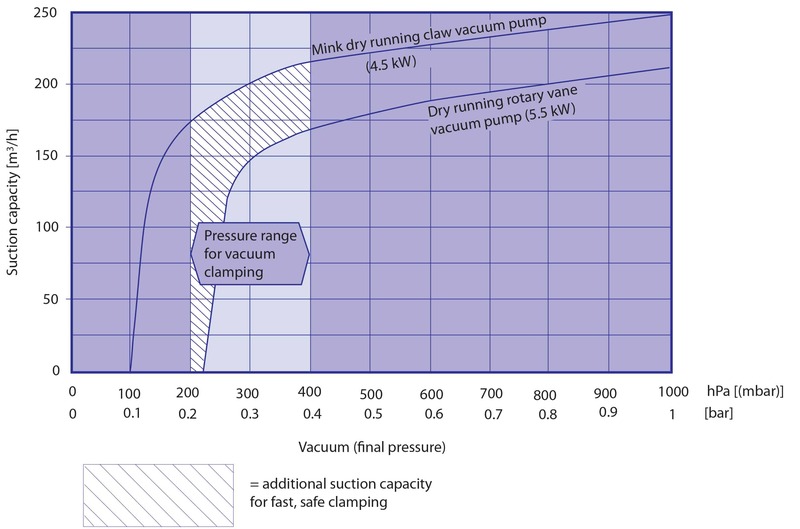 Comparison of the performance data of a dry running rotary vane vacuum pump and a Mink claw vacuum pump. *The next-higher pump size was selected to take into account the fact that a dry-sealed rotary vane vacuum pump reaches an ultimate pressure of 200hPa (mbar) and that the suction capacity decreases due to wear during operation. In many cases, vacuum pumps are thought of only as additional devices on machines and do not receive sufficient attention. In principle, all the vacuum pump types described here can be used for clamping wood and all types reach the required operating vacuum. However, choosing the right technology and keeping energy costs in mind can significantly reduce costs and make production more efficient.